The city is closer than ever to decriminalizing marijuana, but GW and city officials don't expect that to change much on campus. D.C. is closer than ever to decriminalizing possession of small amounts of marijuana, but a new law likely won’t open the floodgates for pot smokers on campus. In a major push forward for the legislation, Mayor Vincent Gray voiced his support for the first time last week. The D.C. Council introduced a bill this summer, backed by 10 of 13 members, to ease penalties for possession of one ounce of marijuana or less. But even with softer sentences for individuals caught with marijuana around the city, universities would still be able to discipline students. “Schools have their own rules regarding drinking or alcohol in dorms regardless of age. Schools always have their own honor codes that do not follow the legal codes,” D.C. Council member Tommy Wells, who helped write the bill, said in a phone interview Wednesday. University Police Chief Kevin Hay said the decriminalization of small amounts of marijuana, if it occurs, likely would not change policies at GW. “Either way, it’s a smokeless campus. You can’t smoke cigarettes in your room, you can’t smoke pot in your room, a burning pizza box in the oven or any of that is a concern for us. We’ll have to wait and see what the D.C. Council does,” Hay said in an interview Wednesday. Under the new laws, violators would face fines of up to $100 instead of a jail sentence. About 1,500 people were arrested for marijuana possession in 2010, a 62 percent increase from 2001. Paul Zukerberg, a D.C.-area lawyer who has represented students charged with marijuana offenses for almost 30 years, said he strongly supports decriminalization because marijuana offenses have “lots of collateral consequences” for college students. Marijuana possession accounted for about 47 percent of the District’s drug arrests in 2010, according to a June 2013 study by the American Civil Liberties Union. About 62 percent of people arrested for marijuana possession nationwide were younger than 25, the study also showed. Zukerberg pointed to increased police patrols around the city as one reason more young people are caught for possession of marijuana. “It’s not only on campus for smoking in dorm rooms, there’s also heightened enforcement behind clubs and venues where young people gather. There is enforcement in all of the music venues, and alleys in Georgetown and on U Street,” Zukerberg said. The ACLU study also found that the District spent the most per person to enforce marijuana rules; it spent $26 million overall on marijuana possession-related law enforcement costs in 2010. Wells said ensuring racial equality was a motivating factor for the bill. The ACLU study found black people are eight times more likely to be arrested for possession of marijuana in D.C., though blacks and whites use marijuana at similar rates. One activist for reforming marijuana laws said the disproportionate arrests among black individuals was not a result of racism within the Metropolitan Police Department, but rather an institutional problem across the country. Allen St. Pierre, the executive director of the National Organization for the Reform of Marijuana Laws, said that class, more than race, factors into who gets arrested. He said public areas and public housing are more targeted by city police departments than private areas like dorms or college campuses. “That area is not only not private, but it’s highly targeted in a way GW’s campus would never be,” St. Pierre said. This summer, in a statement to the Washington Post, MPD Chief Cathy Lanier encouraged a “robust discussion” of the issue but denied that race was a factor in marijuana-related arrests. 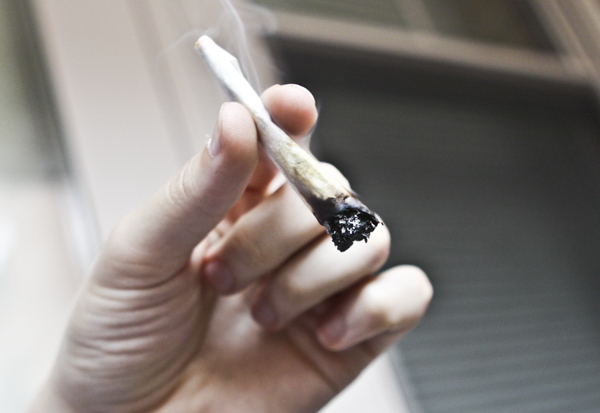 “Some of the information being used as an argument for decriminalization is flawed. Marijuana users are simply not being targeted in the manner suggested,” Lanier said in the statement. D.C. officials will still have to win support from the federal government, which Hay warned could be a long fight. Congress and D.C. leaders first clashed over marijuana-related legislation in 1998 when Congress blocked legislation to legalize medical marijuana for over a decade. Congress eventually reversed its decision in 2009, allowing D.C. to join the 20 states where marijuana use is permitted for medical purposes. The first medical marijuana sales in the District occurred this July. If the law passes the Council and Mayor Gray, Congress would have 60 days to review the legislation. Easing marijuana penalties has increased in popularity recently, with an October Gallup poll showing that for the first time, a majority of Americans – 58 percent – support legalizing marijuana. This article appeared in the October 28, 2013 issue of the Hatchet.